Although I am always sad to hear when a culture warrior has passed on, I am also secretly thrilled to see the New York Times obituary because it’s exciting to me to see my counter-cultural heroes celebrated in the mainstream press, even when that exposure is post-mortem. In this instance, I heard a few days ago of the death of Alexander Shulgin, a psychedelic researcher, chemist, “neuronaut” of the psychoactive frontier, and synthesizer of more than 200 psychoactive substances, including MDMA and many related compounds. (MDMA was originally produced by Merck pharmaceuticals in 1914, but when the company failed to find a way to monetize the substance, they allowed their patent to lapse, thus allowing Shulgin to re-synthesize the substance about half a century later.) Although I would not describe myself as a drug user per se, I have been long fascinated by the effects of psychoactive plants and chemicals on the human (and animal) psyche, by the variety of the chemicals and plant substances that have been traditionally used to alter reality, and by the lengths to which humans and even other animals have gone for eons to chemically enhance or alter their reality, whether for spiritual, therapeutic, recreational, or other reasons. (Among the more unique small books in my collection is the aptly titled, Animals and Psychedelics, which anecdotally explores “the natural world and the instinct to alter consciousness,” according to its subtitle.) Most people who know me at all, even superficially, know of my fascination with herbs, supplements, and other natural substances, both with the rainbow of available options and the effects of these substances on the healthy functioning of our brains and bodies. What is less well-known — and really, this is partly by design because of the stigma that usually surrounds such subjects — is how I came to the study of herbs and medicinal substances at all. I never set foot in a health food store, that I can remember, until the day I went into one to apply for a job. As a child I was a student of the outdoors, and I always enjoyed learning about wild things. In summer camp, I had a healthy fascination with outdoor crafts and learning survival skills, but really none of those experiences properly prepared me for my later encounters with wild foods, foraging, or the immense power of some innocuous-looking flowers, trees, etc. to heal or harm when used correctly or incorrectly. At camp, we pressed flowers and butterflies, learned how to start a fire without matches, how to shoot a bow and arrow, how to make rudimentary shelters, even how to make crafty things out of plants, rocks, etc., but I don’t remember a single syllable being uttered about how I should feed myself or give first aid if I found myself in the wild without food or a first aid kit. Truthfully, our instructors geared any early preparedness training more toward what we should bring from home to properly protect ourselves from the elements until help could get to us, not how we should feed ourselves if we became separated from our food supply or first aid kit. So how did I come to the study of medicinal and edible wild plants? Partly as a function of all the reading I did in high school about cultural upheaval in America in the 1960’s, I fell down a number of literary rabbit holes, digressing to dig deeper into various subjects and into the lives and literary works of culture warriors and iconoclasts. I read extensively about the lives and lively interactions of the Beat poets, spending a lot of quality time on Allen Ginsberg (an early gay hero of mine), William Burroughs, and Jack Kerouac. Kerouac led me to Neal Cassady, who led me to Ken Kesey and the Acid Tests. Ginsberg led me to the gay counterculture and to Bob Dylan. I was already listening to the Grateful Dead, the Doors, and other bands, and it was thrilling to me to read about how Ginsberg, Cassady, Kesey, Dylan, and the Dead collided in psychedelic space and helped to catalyze one sphere in an already chaotic countercultural universe. Reading a biography of The Doors’ Jim Morrison, I learned about Baudelaire, Verlaine, Rimbaud, and the French literary counterculture that swirled around them. Everywhere woven through these literary conversations was the creative use of plants, absinthe, alcohol, or other substances. In many cases, as early as high school English, I learned how substances like these influenced the life and creative output of artists, writers, and other cultural icons. (Samuel Taylor Coleridge’s use of opium springs to mind; reputedly, “Kubla Khan” was reputedly written under its influence .) Throughout my early forays into these controversial subjects there was always the background chatter from Nancy Reagan’s Just Say No campaign. The chatter suggested that no matter how many writers and artists produced great works while under the influence, their success was almost accidental, and their work was of dubious value because of how they created it. Imagine my surprise when I had my first psychedelic experiences in college and realized that not only do a lot of these substances “work”, but they work well and there is not necessarily anymore likelihood that you will die the first time you try them than if you over-consume alcoholic beverages, which are legal. In some cases (weed, for example), there is even less chance that you will overdose than with alcohol. True, they aren’t for everyone, and there is a chance of psychological damage or physical injury if one is too casual or doesn’t pay proper attention to what is known in the psychedelic world as “set and setting.” (1) In any case, I was sad to hear that Alexander “Sasha” Shulgin had passed on but glad to see The Times give his life and work a nice review and give him a final send-off. 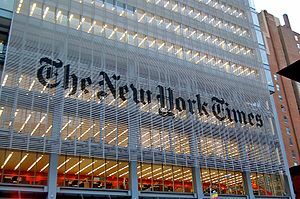 I am an inveterate reader of the reader of the New York Times. Every day I manage to find some small moments to dig in and see what’s going on in the world, across the United States, or even just in New York. Quite often I find a story that appeals to my many interests. Today’s offering was a window into 18th century Colonial history as well as the adventure stories of my youth. I remember when I was a kid being given a tattered cheap paperback copy of the original 1932 novel The Mutiny On The Bounty by Charles Nordhoff and James Norman Hall. It joined other treasured adventure books. Favorites included copies of Robert Louis Stevenson’s Treasure Island, Three Musketeers by Alexandre Dumas, and Mister Roberts by Thomas Heggen. I pored through all of those books, drinking in the rich details of bygone eras. Imagine my surprise today to see that the original mutineer on the HMS Bounty, Fletcher Christian, had a great-great-great-grandson who was well know enough to get almost a half page obituary in the New York Times. Fletcher Christian’s descendent, Tom Christian, died over a month ago at the ripe old age of 77. At the time of his death, he still lived on, and in fact was the most well-known voice of, Pitcairn Island, part of the Pitcairn archipelago, Britain’s last colonial possession in the South Pacific. 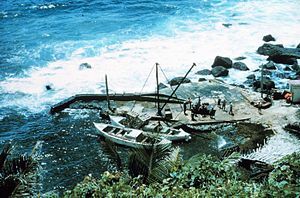 Pitcairn Island’s only real claim to fame, at least in the positive sense, is as the final resting place of the HMS Bounty. It has, according to the Times, a “permanent population” of 51 people and survives on quarterly supply deliveries and sale of baskets, honey, stamps, and trinkets (carved from wood they harvest on one of the uninhabited islands of the Pitcairn archipelago). If you didn’t have a chance to read this obit, it is well worth your time to catch a glimpse of a vastly removed time in history. Indeed, the famed mutiny took place in 1789. To read the article, go here. There are differences, of course. There always are. Holland Cotter had a sister, I had a brother. His father was a medical doctor, mine has a PhD. His parents allowed him to wander freely through museums because they used the museums as a sort of “surrogate nanny” (his words). Our family went to museums together, more as a family outing. Still his description of being seized by the aesthetics and the obvious stories of the Pre-Modern art initially and then gradually beginning to read the descriptions because he needed to know more, until finally he took notes on what he saw, all of that seems very familiar. I did a lot of that too and do still. I also write a lot, though perhaps (not yet) as well, and certainly not for as well-known an outfit as the New York Times, but still, the similarities were startling. At any rate, the entire piece is definitely worth a read if you have the time. It’s today’s paper, page A1, “Finding Poetry on the Page and, Later, on the Canvas,” by Holland Cotter, for the Critic’s Notebook. Facebook is a miraculous site. Through it, I keep in touch at least provisionally, with many, many more friends than would otherwise be possible. Through my news feed I can maintain a running commentary on my friends reading habits and be exposed to media documents I might otherwise never see. To keep things in perspective, though, my engagement with most everything that crosses my screen is pretty superficial.